The Canadian Free Press recently published the Institute for Energy Research's summery of the most recent Energy Information Agency's Annual Energy Outlook (AEO) estimate of Levelized Cost of New Generating Technologies, 2016: Revised AEO 2009 Reference Case. The whole table can be viewed here. The table below provides the average national levelized costs for the generating technologies represented in the updated AEO2009 reference case. The values shown in the table do not include financial incentives such as state or federal tax credits, which impact the cost and the competitiveness of the technology. These incentives, however, are incorporated in the evaluation of the technologies in NEMS based on current laws and regulations in effect at the time of the modeling exercise, as well as regional differences in the cost and performance of the technology, such as labor rates and availability of wind or sun resources. . . . The levelized cost for each technology is evaluated based on the capacity factor indicated, which generally corresponds to the maximum availability of each technology. . . . Intermittent renewable resources, e.g. wind and solar, are not operator controlled, but dependent on the weather or the sun shining. Since the availability of wind or solar is dependent of forces outside of the operator’s control, their levelized costs are not directly comparable to those for other technologies although the average annual capacity factor may be similar. Because intermittent technologies do not provide the same contribution to system reliability as technologies that are operator controlled and dispatched, they may require additional system investment as back-up power that are not included in the levelized costs shown below. In short the table reflects the cost of electricity from the various energy sources. In the cases of solar and wind, making the electricity reliable will cost extra. 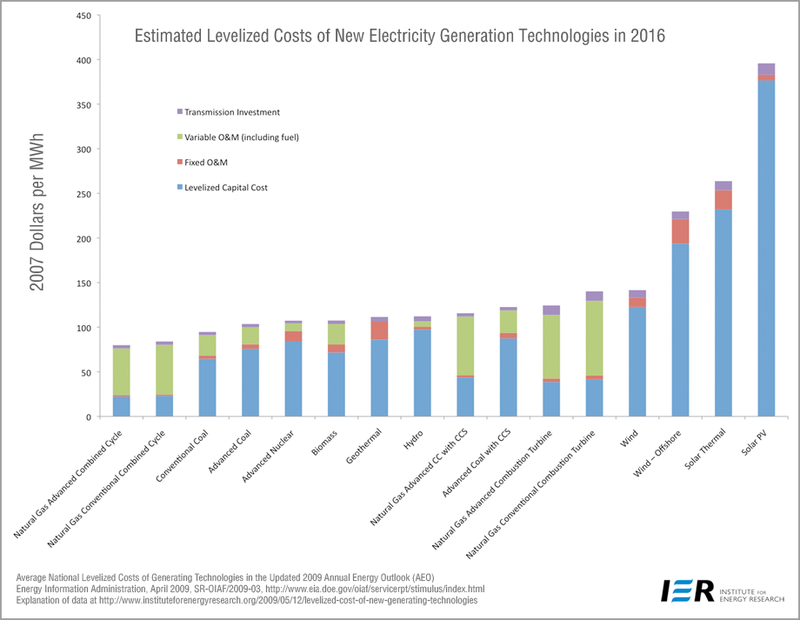 It should be noted that the both the levelized costs of nuclear as well as its total levelized cost is significantly lower than the cost of land based wind generated electricity and when the comparison is shifted to off shore wind, Solar PV, and Solar Thermal, the cost gap between nuclear and renewables becomes enormous. This supports the result of my original 2007 post-carbon energy analysis that concluded that Solar and Wind Energy options would be substantially more costly than nuclear. This assessment does not focus on potential cost savings of alternative (Generation IV) nuclear power. What concerns me about levelized cost advantage of nuclear power is that it is not competitive with the levelized cost of Chines nuclear power and is even less cost competitive with the levelized cost advantage of Indian Stage 3 nuclear technology. Stage 3 Indian nuclear power which may cost close to half of the Chinese nuclear power cost. The levelized cost of stage 3 Indian nuclear PHWRs may fall to 15 compared to 84.2 for American Nukes. Factory produced small American nukes might cost 50% less than large nukes, while LFTRs have the potential of falling to a levelized cost as low as 20. Now I know why I don't always find good answers when I Google. I wonder what the economics of wind energy would be if a recent report about declining wind strength because of global warming proves to be true. According to an Iowa State University scientist, the intensity of wind dropped ten percent during the last decade which could effect the output of a wind turbine by about 30 percent. It looks like those natural gas power plants we are building in spades will be working overtime to make up for wind energy's slack. You can read more about declining wind strength by using the link below. The economics of much of the 'Greenpeace' agenda are simply insane. The latest is a German plan to generate 100GW of power in the Sahara, costing $560bn. Leaving aside the fact that the only such scheme currently being built basically exports electricity from natural gas burn, lightly supplemented by solar, if you feed in a realistic capacity factor such as 25% you come out to around $2240kw, and even then you have not allowed for the fact that even at the latitude of the Sahara energy production would peak in the summer when it is not needed, leaving a large shortfall in the winter when it is. The bottom line is that such schemes are fantasy, not real-world engineering, and are only considered due to an inability to face reality. David, I usually use unrealistically generous assumptions whan i calculate renewables cost, because I know they are going to look bad anyway. I see no point to argument that would occur if I offered realistic assumptions. Some of my realistic case studies have pointed to reliable renewable electricity costing over $20,000 per kW of reliable capacity. Don't you mean "they are only considered because their authors believe that StormSmith is factual" ? No doubt nuclear is better for energy cost and energy security, but the desert CSP idea is actually an improvement over their present energy trajectory, which will probably result in German electricity that is 20% renewable and 80% from Russian natural gas in 20 years. As expensive as CSP currently is, at least it has the upside of 70% capacity factor (with storage and desert location), unlike wind, which has about 35% in Germany. This is a factor of 2 reduction in natural gas required to fill in the blanks. The other problem with desert CSP for the Germans (in addition to not being a domestic resource) is that of its high critical mass. Long distance power transmission does not become cost effective until the lines get big, like 7 GWe each (for 800kVDC). So the minimum system is about 14 GW with multiple lines. Their current renewable energy portfolio has 5.3GW of solar and 23.9GW of wind, so this would not be out of line for them. The legitimate support for solar energy in the US is based on the hope that the cost will come down within the first 10GW of deployment (according to the DOE). The sooner someone (e.g. Germany) proves out a high volume price for CSP, the sooner we can get on with the nuclear renaisance. Germany actually gets a disastrous capacity factor of under 20% for wind. The 70% capacity factor you are quoting for wind is pretty generous, as you would need a large amount of storage for that. The only actual structure being built relies on natural gas burn to create a worthwhile capacity factor, and is in fact mostly natural gas. The real killer though for TREC is annular variation. You either have to have a vast overbuild to cope with winter design, or you need to do something like produce ammonia with surplus capacity in the summer and store it for months. In practise, you really need to have another energy source to cope in the winter, which can be run at low capacity in the summer -Russian gas being the realistic option. Everything the Germans are doing seems to build in coal and gas burn, rather than provide fundamental solutions. I doubt that the US needs to see 10GW of solar built to get the right costs. In the South West where solar incidence coincides with cooling peak needs then 2-10MW installations at the edge of small towns can avoid transmission lines and large voltage changes, and if ground built or on commercial rooftops are cheaper to build and maintain. Solar in hot areas for peaking needs should be fine. It is when you start trying to run it for baseload, or even more absurdly, transport it huge distances to provide winter warmth in cold northerly climates that the whole exercise becomes absurd. You need LFTRs for that.